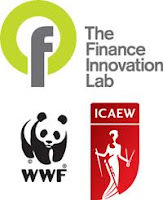 It's not every day you get to brainstorm ways to bring diversity and sustainability to Britain's ailing financial system amidst a broad cross-section of officials, economists, entrepreneurs, think-tanks, technology suppliers and advisers. And the Finance Innovation Lab workshop was a golden opportunity to do just that. While the Lab will report the output in due course, I thought I'd share a summary of my notes from the breakout sessions in which I participated. These looked at regulatory barriers and lack of financial awareness. Others explored the unfair advantages enjoyed by estalished providers and ways to encourage innovation. We operated under the Chatham House Rule, hence the absence of names or affiliations. The UK financial system is neither diverse nor sustainable.